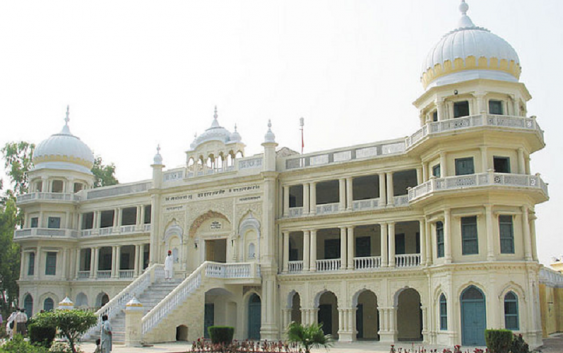 This Gurudwara is about 37 miles from Lahore on the Lahore-Lyallpur Railway Line. Mehta Kalu, father of Guru Nanak, gave him Rs. 20 /- to start his first business. On the way to his destination, Guru ji met few hungry sadhus. Guru ji decided to use his money to buy groceries and prepared langar to serve hungry Sadhus. Later, when Mehta Kalu learnt about it, he was not happy with this decision. Maharaja Ranjit Singh built a Gurudwara at this place, where Guru ji served langar to Sadhus. This beautiful Gurudwara is shaped like a fortress. The very impression of the Darshani Deorhi attracts the congregations.